What exactly is a Spiritual Channel? What is a Spiritual channel? Channeling is allowing spirit to flow through you or serving as a conduit or vessel to bring through messages from the Higher Realms of Light to share with people. One way to channel the Beings of Light is through the voice. Are there different ways to channel? There are many ways people may channel. 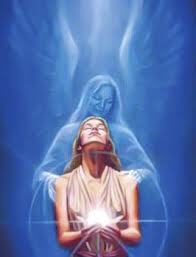 Allowing a spirit guide or a Being of Light to use a person’s voice is only one way to channel. The beings from the higher realms can and do channel in a myriad of ways. In addition to channeling messages or teachings, the Beings of Light may channel or project innovative ideas and or creative works of art such as, literature, painting and music through people living here on Earth. This may be done with or without the recipient knowing it is happening. The guides will often assist people with challenges by channeling helpful solutions to them. Some understand where this information is coming from; often they do not. I have only mentioned a few ways that spirit guides will work with us here on Earth. When I first began to receive communications from the higher realms my main guides were from the Pleiades, specifically a group who refer to themselves as the Akasie. The Akasie explained to me that my origin was Pleiadian. Throughout my lifetimes on the Earth, the guides who have worked with me have always been from the Star system of Pleiades. However, I am able to work with other Beings of Light as well. Since I began my career as a channel or Pleiadian messenger, I have had communications with others from different planets and star systems and other Beings of Light such as ascended masters, angels and so on. Some have identified themselves as members of the Galactic Confederation. What can you expect from your channeled Angel Reading? Every channeled reading is unique and tailored specifically to the needs of the recipient(s). Our spiritual guides work for the Highest Good of Creation. They are here to “guide” us. Not to do the work for us. Our guides have the ability to read the energy of all participants and know what would benefit you the most. Because our guides love to have an exchange of communication there is an open invitation for you to ask questions during any reading. To be involved in your reading by asking specific questions is a way to stimulate your mind. In addition, asking questions or making comments is a way to take responsibility for your life. To ask questions you will ultimately gain a higher understanding of their messages and broaden your scope of awareness. The readings given are always multifaceted-meaning there are several levels or layers of understanding to their messages. In order to glean a deeper meaning of your reading, it is recommended that you listen to your reading (the CD provided) several times over an extended period of time. Do all channels work the same way? All channels are unique and have their own style to deliver messages. There are conscious channels. This is what I am. When I channel I am fully conscious-meaning I am awake and hear what the guides are saying through me. During a session, I may receive visions or telepathic communications (in the mind) in addition to channeling their message with my voice. Some channels receive the information telepathically and then pass on or repeat the information to the client. Channels may receive information through any of the physical senses to convey messages. Other channels do what is called trance channeling. After the channel “wakes up” from a session they do not have a conscious memory of what has been communicated through them. Do all spirit guides communicate in the same way? Because God has created us to be unique we all have certain ways how we express ourselves. Spirit guides and other beings from the higher realms are not an exception.They have mannerisms unique to them as well as the method they deliver their messages, (I am referring to speech patterns, accents, and even languages). Even so, they have the ability to adapt to our way of communicating making it easier for us to receive their messages. However, this is not the entire story. Some guides will choose to communicate, for example, through music or vibration and never speak to us. Does this mean that Spirit Guides and Beings of Light have chosen a specific way to serve humanity? Yes! I have found over the years that each being that I communicate with serves in a particular way. Some guides are qualified to teach in a specific area while some remain in the background giving support with love. What I have given you is a quick synopsis. Please remember that there are unlimited life forms and intelligence in the universe. We are just beginning to understand what they have to offer us.